Have you tried the Leonardo Da Vinci Free Puzzle Game before? If yes, please consider recommending it by clicking the Facebook "Recommend" button! It was tested with 27 different antivirus and anti-malware programs and was clean 96% of the time. 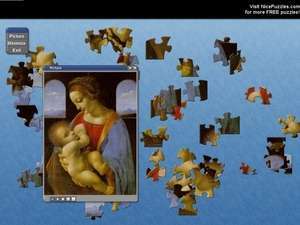 View the full Leonardo Da Vinci Free Puzzle Game virus and malware test. Tip: If you're experiencing trouble downloading this file, please disable any download managers to leonardo da vinci free puzzle game download vista you may be using. If you're receiving a 404 File Not Found error, this means the publisher has taken the file offline and has not updated their links with us for Leonardo Da Vinci Free Puzzle Game. Please do drop us a note in the event of a missing file. Spidla Data Processing Inc provides their software as a Windows Executable file and therefore installation is as easy as downloading the file setup.exe and running it directly after retrieving it. We highly suggest using antivirus software before running *any* files from the Internet. The company hosting this file has a trust rating of 5/10. Puzzle Games - An engaging brand-new version of the beloved Lines game with nice 3D effects. Puzzle Games - Computer jigsaw puzzles. Create play and share realistic jigsaw puzzles. Puzzle Games - Try to save the smart mouthed Kangaroo from a good old fashioned lynching. Puzzle Games - Relaxing puzzle game. Swap jewels and align.